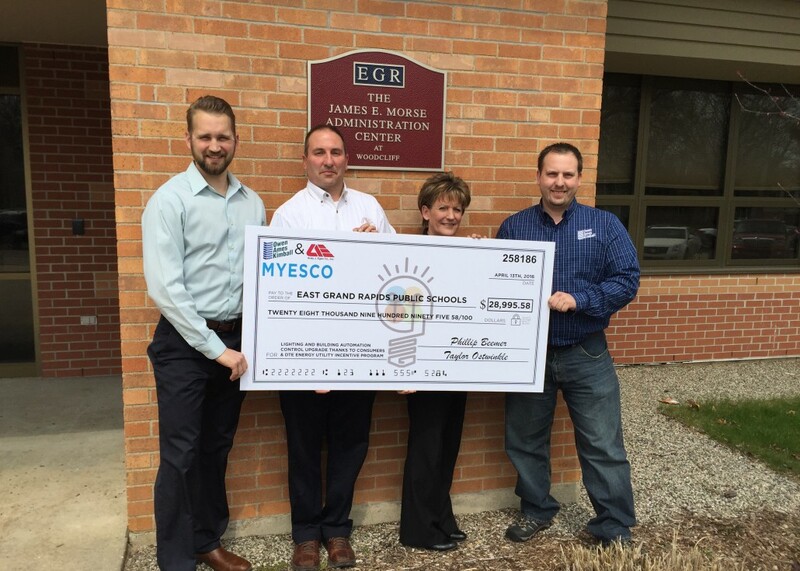 East Grand Rapids Public Schools received their Utility Incentive check for the improvements they made to become more energy efficient across their school district. They completed a number of different projects at multiple schools with the services of Owen Ames Kimball and Andy J. Egan Co. EGRPS installed LED lighting with occupancy sensors and building automation system upgrades in each facility. These energy upgrades qualified the school district for Utility Incentives through the Consumers Energy and DTE Energy Incentive Programs. MYESCO (a registered CE and DTE Trade Ally) processed applications that resulted in EGRPS receiving a check for $28,995 from Consumers Energy and DTE. If you are looking to upgrade any of your current energy/building management systems, contact MYESCO today for a free consultation. Consumers Energy and DTE offer Incentives through their respective programs for a large number of energy upgrades. Our energy engineers can evaluate potential equipment and systems to help you select the best options moving forward.